Cadaverous Condition delivered an epic record which encompasses a lot more than mere musical genres. Cadaverous Condition are an Austrian Death Metal band and these guys have been around since 1990. Yeah? So what? Why would we feature a Death Metal band on Doom-Metal.com anyway? 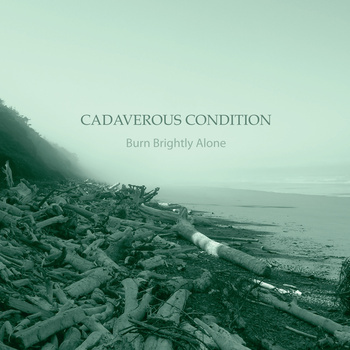 Well, to some extent Cadaverous Condition’s latest effort Burn Brightly Alone may qualify for a review in our pages. You see this band is very special. First of all, they play this strange mixture of Folk music and Death Metal. When you read Folk Death, you’d instantly think of bands like Orphaned Land or Kartikeya but you couldn't be more led astray than this. In the Metal spheres, usually people tend to think Folk elements as additional flute played naked under the moonlight of Siberia or arctic freaking Finland or sometimes Metal with instruments whose names are impossible to read aloud (and most likely written on the liner notes with spelling mistakes)… Well you know the drill, we like the music of our ancestors and we like Metal… we play Folk Metal. Cadaverous Condition are on yet an altogether different plane of Folk: more Folk-Rock in the Dylan, Baez and Faithfull style mixed with Death Metal! This means a fair share of acoustic guitars and piano with all you may expect from a regular Metal band. At times the music featured on Burn Brightly Alone is energetic and almost cheerful (‘Ghost’, ‘Alone I Will Travel In Time’ or ‘Wicklow Nightall’) but sometimes it tends towards bleaker vistas quite comparable to what Doom Death has to offer (‘Order of the Forlorn’, ‘The Clearing’, ‘Deathless’). Actually the second half of the record will appeal more to the tastes of our readers and the lyrical themes explored – on life and its disillusions – clearly show the face of a band that doesn't expect more than the end, only wishing it to be not as painful as it seems. The only thing that is for certain when listening to ’Burn Brightly Alone’ is that the Austrians have delivered an epic record which encompasses a lot more than mere musical genres. This experience is human: it has joy, anger, compassion, love and sadness all mixed together as if each and every song would be the reflection of a different emotion. It is bold and daring and will only give its full flavor to those willing enough to embrace the experience whole-heartedly and if, for this only, I’m glad to have them featured here and now. Duration : Approx. 51 minutes. Visit the Cadaverous Condition bandpage.